2013 Court Decision Presents Interesting Take on Indemnification Analysis - Martin|Hild, P.A. The Second District Court of Appeals’ ruling in Pilot Construction Services, Inc. v. Babe’s Plumbing, Inc. presents an interesting take on contractual indemnification. The subcontractor in Pilot argued that a general contractor’s claims were barred under Florida Statute § 725.06 because the indemnification provision allegedly covered the general contractor’s negligence. The Court disagreed and held that the general contractor only sought indemnification for the subcontractor’s own negligence and not its own. Therefore, the general contractor’s demand for indemnification was not barred under § 725.06. 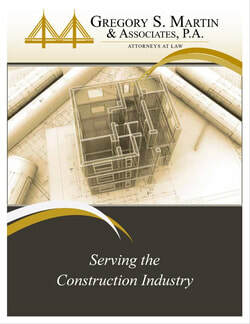 In Florida, indemnification provisions found in construction contracts are governed by Florida Statute § 725.06. The statute was codified in 1972 and introduced the requirement of a monetary limitation or the use of specific consideration as a requirement for the enforcement of provisions which seek indemnity for damages related to ones' own negligence. Fla. Stat. § 725.06 has evolved since its inception with its most recent changes going into effect in 2001. Under § 725.06, if a party wishes to seek indemnity for its own negligence, there must be a "monetary limitation on the extent of the indemnification that bears a reasonable commercial relationship to the contract is part of the project specifications or bid documents, if any." if the provision is found to be in violation of the Statute, the court will discard it. The Pilot case is unique because the Court did not analyze or discuss the indemnification provision included in the parties' contract in reaching its decision, Rather the Court focuses on the actual claims brought by the general contactor in its complaint. The complaint was narrowly tailored and the Court stated that a "plain reading" made it clear that the claims were for the subcontractors own negligence and not that of the general contractor. Thus, by only seeking indemnification for the subcontractor's negligence, the general contractor avoided the limitations set forth in the statute. Pilot Const. Services, Inc. v. Babe’s Plumbing, Inc., 111 So.3d 955 (Fla. 2d DCA 2013). See Fla. Stat. § 725.06 (2014). While courts may look past a contract provision depending upon specific facts, the better practice is to follow the statute for a valid indemnification provision.